Baculovirus Titer Assay - Increased Batch-to-batch Consistency | Proteos, Inc.
How is baculovirus used in expression of recombinant proteins? Proteos offers baculovirus mediated protein expression in our fully licensed Sf9 (Spodoptera frugiperda) and Tni (Trichoplusia ni) insect cell lines. Both cells lines are suited to production of intracellular or secreted recombinant proteins possessing a majority of the post-translational modifications found in mammalian cells. The Tni cell line has been shown to produce significantly higher levels of secreted protein expression in many cases. The baculovirus expression vector systems (BEVS) uses homologous recombination or site-specific transposition to produce recombinant virus encoding the protein of interest. The baculovirus is then used to infect insect cells that in turn express high levels of recombinant protein. To ensure accurate MOIs (multiplicity of infection) and reproducibility of each production run, Proteos utilizes a robust plate-based flow cytometry assay for determining the titer of baculovirus stocks prior to infection of insect cells for protein production. The titer of each virus stock that we produce is determined in triplicate using a plate-based flow cytometry assay. 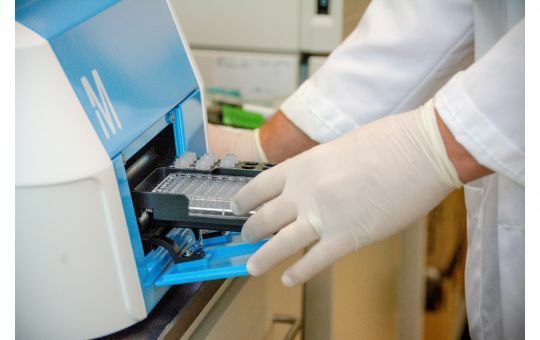 We routinely produce high-titer virus stocks with titers ranging from 5 x 108– 2 x 109 infection units (IU) per milliliter in a single amplification. Why is it important to determine the titer of each baculovirus stock? Understanding the multiplicity of infection (MOI) is an important step in the production of recombinant proteins using baculovirus infected insect cell expression platforms. The MOI is a measure of the number of infectious virus particles used for infection relative to the number of insect cells in the culture. Our experience producing hundreds of unique recombinant proteins has demonstrated that an accurate MOI is essential for predictable infection kinetics and reproducibility during multiple production runs. What methods are available for baculovirus titering? There are predominately three methods used to infect insect cells with recombinant baculovirus; volume:volume ratio with untitered virus , MOI by plaque assay, and MOI by fluorescence based titer determination. Proteos has experience with all three of these methods. The untitered, volume:volume ratio method is performed directly from the initial or amplified (P0, P1, or P2) baculovirus stocks, or from cryopreserved baculovirus infected insect cell (BIIC) stocks based on a specific volume per unit of culture. While this method allows the user to proceed directly to culture infection without incurring the additional time required for titer determination, it can lead to inconsistent results and poor reproducibility, since the titer of amplified baculovirus stocks can vary by more than 10-fold, and decreases over time. In addition, this method does not allow researchers to design consistent protein expression optimization studies that test multiple MOIs (multiplicity of infection). Another common method of titering baculovirus stocks is to perform a plaque assay. There are published protocols and commercially available kits for this method. Unfortunately, these methods are inconsistent, time-consuming, and often underestimate the virus stock titer 10-fold. Proteos offers a flow cytometry assay for baculovirus titer determination that utilizes fluorescent-tagged antibodies specific to the viral coat protein gp64. We have found this rapid method to be the most accurate and reproducible method for determining baculovirus titer. How does Proteos determine the titer of baculovirus stocks? The titer (infectious units (IU) per milliliter) of a baculovirus stock is determined by measuring the expression of gp64 (a baculovirus envelope protein) on the surface of infected insect cells eight hours post infection (hpi). Our method measures the number of infected cells over a series of nine dilutions of the baculovirus stock ranging from 1:2 to 1:100,000. The assay is formatted for a standard 96 well plate, requires a minimum volume of baculovirus stock (600 µL minimum per sample), and is performed in triplicate so you can be confident of the results. Results are delivered in as little as 3 business days from receipt of the samples. You will receive a full data sheet containing the assay data for all three replicates of each sample. We determine the titer of each replicate sample by selecting the linear range of the data set. The data sheet will also report the titer of your baculovirus stock in infectious units per mL (IU/mL). The reported titer is the average of the three replicates. How do I order Proteos’ baculovirus titer determination service? Click here for additional information and to request this service.